A collection of 6 mermaids have joined forces leading the mermaid explosion soon to happen in Europe. Introducing: Mermaid Ariel Starfish, Mermaid Celine, Mermaid Evi, Mermaid Lelie, Lexie Mermaid, Mermaid Naomi. 5 are from Belgium, one from France, but they travel to different locations to perform. Keep reading to learn more about their story and how to get in contact with them! When did mermates start? What was the inspiration? We started in October 2017. We were 5 mermaids hired by a diving centre (Todi Beringen: www.todi.be) to perform at their opening ceremony. We worked out “tails” off to get a nice synchronized swimming sequin to perform. It was a lot of hard work but we did it! While working hard, we became friends. A lovely side effect 🙂 After the opening we started talking about becoming a collective with our own brand. And so Mermates was born! In February 2018 we added a new member. We are 6 mermaids right now. We stay at 6 for a while. It is already crazy to find a spot in all of our agendas for our monthly meetings. Sadly no, most of us have another job at the side. Mermaids aren’t that popular just yet in these areas. But we are noticing an increase interest. So who knows, maybe it will be possible in a few years time for some of us. Always start with fabric one to learn how a tail works. We recommend investing in a good monofin from the beginning. It is so important to use the right tools to prevent injuries. Once you have the proper technique you can look into a silicone or sequin tail. Although fabric tails are getting more and more impressive nothing can beat the feeling of a silicone and sequin tail. It makes the mermaid so real. They give that much more glamour! Where do you see the mermaid industry going in the next 10 years? It is going to boom in Europe. Right now it is still a bit odd. But you can feel that there is more and more interest coming. And we must admit that the world needs more mermaids! The last weekend of April we are organising the Mermates: international mermaid convention. This is the first 2-day convention in a diving centre in Europe. We hope that organising those kind of events can help to get the word out. Caring for the environment is something that is so important to every mermaid. Without clean water there won’t be any mermaids or people left. Mermaid tend to look after it very well and everyone should lend a hand when it comes to our planet. Mermaids are so empowering. They can inspire people to be themselves in a world that want more of the same. You can be that special snowflake, or mermaid, or whatever you like. Don’t let other hold you back, take your craziest idea and go get it! You need to work hard, nothing comes from sitting on you bum, but you can do it! What is your favorite mermaid or ocean themed quote? What is your favorite mermaid or ocean themed item or clothing? 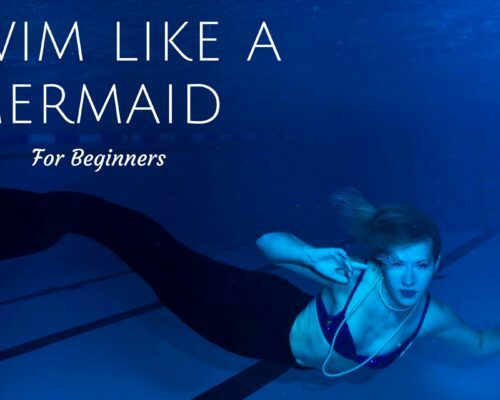 Any tricks or tips you would recommend for aspiring mermaids? Start with investing in a good monofin. Take some classes to get the proper technique. Be aware of the danger. If you have to possibility, become a certified free diver. And after that you can go wild. Nothing is too much for a mermaid so you can go all the way with your make up and accessories. Do you have any water or mermaid certifications? Some of us are trained free divers and scuba divers. We also have a certification in being a mermaid teacher. Make sure to check out these European leading ladies!